By Ahmed Bilal on December 16th, 2010. 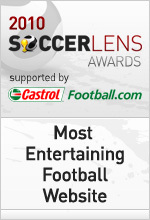 We interviewed the 2010 Soccerlens Awards nominees this week to ask them about who they would vote for, the secrets to their success, who they would pick as the best footballer in the world and what they thought about the Castrol Football Rankings. Football is all about opinions and the Castrol Football Rankings are a fantastic way of igniting discussion as to who is the best player in the world, what the outcome of games will be and a number of other topics. In my eyes the best player in the world is Lionel Messi, something the Castrol Football Rankings agrees with too. Easy to use, insightful and probably most accurate by the methodology described. Best player at the moment has to be Messi for me. As a numbers guy, I like the concept of the Castrol Football Rankings and admire the objectivity. What’s interesting to me is that the rankings don’t just highlight the obvious stars like Messi and Ronaldo (though they are indeed the top two), but they also feature lesser know talents like Lucas Barrios, the Dortmund striker, who is currently in sixth place. That said, it’s difficult to look beyond Messi as best footballer in the world, especially with El Clasico so fresh in the memory. I love the concept a lot, but I don’t think it will put a stop to who is the best player debate. It will, however, show based on facts who is actually the best performing player. I’d love If FIFA considered Castrol’s system in their FIFA Player of the Year Award. The best footballer in the world right now? It’s hard to answer and it’s “IMPOSSIBLE”, in my humble opinion, to compare between football players especially if they were ones like Ronaldo & Messi. My answer is this; it is all down to preference. For me it’s Cristiano Ronaldo not because he plays for Real Madrid, but I like his style, I like the fact he is physically very strong, can score from free-kicks, headers..etc a “complete” player, but that doesn’t mean he is better than Messi. As I said it is all down to preference, I prefer Ronaldo over Messi the same way I prefer Maradona over Pele. Comparing footballers will always be inaccurate especially if they were of the calibre of Messi, Ronaldo Pele and Maradona. The best footballer in the world at the moment is either Lionel Messi, Xavi Hernandez or Liam Lawrence. Take your pick. I haven’t spent much time with the rankings, but they look interesting. I’ll probably get criticized for sounding American here, but I think increased use of the right statistics will help soccer, not hurt it. Best in the world right now? Lionel Messi, an absolute joy to watch. I’m certainly aware of them but to be honest they operate at a different level, my head lives in a more humble space where Kevin Davies’ key passes are more relevant than whether Messi is a better player than Ronaldo. Player indexes have their value and they make a great platform for debate and discussion but I’ve pretty certain that if I started soaking up the stuff that the Castrol rankings supply, I’d literally burn out. These days I have to be pretty single minded; If the information isn’t likely to earn me or my visitors Fantasy points, then it gets ignored. I’m a little worried that one day I’ll start applying the same rule to conversations. Like most football fans we enjoy statistics although ranking individual players is difficult for a team game. Castrol have it right about Lionel Messi, no doubt about that, but where is Gareth Bale in the top 40? I’ve been a big fan of the Castrol rankings since Euro 2008 which they covered head to toe. The data they provide is really intriguing. As for the best footballer in the world, most people will probably say Lionel Messi. But being Welsh and a former winger myself, I have to vote for Tottenham wunderkind Gareth Bale. Also see: 2010 Soccerlens Awards Interviews.